David Blight, a renowned historian whose new book, <em>Frederick Douglass: Prophet of Freedom</em>, has been published to glowing reviews, will be in Rochester Dec. 3 and 4 for two engagements co-sponsored by RIT. 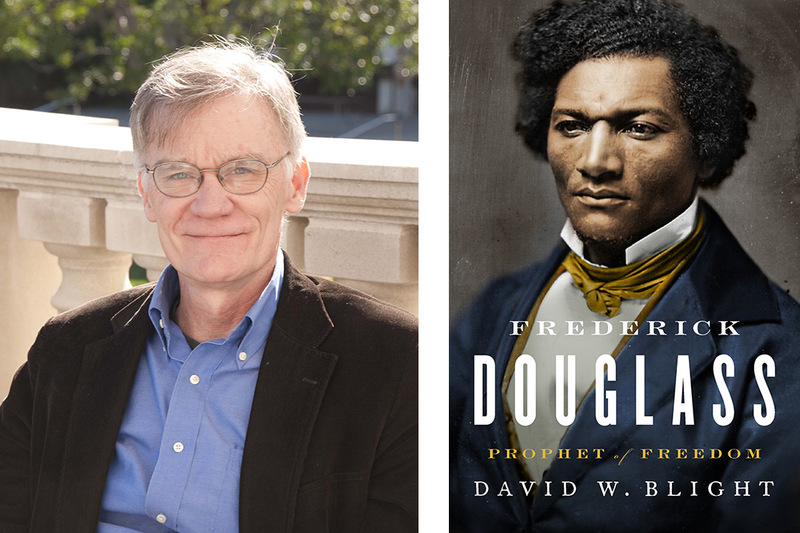 David Blight, a renowned historian whose new book, Frederick Douglass: Prophet of Freedom, has been published to glowing reviews, will be in Rochester Dec. 3 and 4 for two engagements co-sponsored by Rochester Institute of Technology. Blight will be the featured speaker at “Prophet of Freedom: Frederick Douglass in Word and Song,” at 7 p.m. Dec. 3 at Hochstein Performance Hall, 50 Plymouth Ave., Rochester. The event, co-sponsored by the University of Rochester, also includes musical performances. It is free and open to the public, but registration is encouraged. Blight, the Class of 1954 Professor of American History and Director of the Gilder Lehrman Center for the Study of Slavery, Resistance and Abolition at Yale University, wrote his book after a decade of research on Douglass—who spent much of his life in Rochester and is buried in Mt. Hope Cemetery. The book, which reviewers have called “monumental,” “moving” and “brilliant,” includes new insights from a private collection of letters on the Douglass family. Blight says Douglass was not only among the most famous Americans of the 19th century, but one of the nation’s most original and enduring voices. The event at Hochstein will pay special attention to Rochester’s importance in Douglass’s life. The program will take place on the 171st anniversary of the inaugural edition of Frederick Douglass’s first newspaper, The North Star, which he published on Dec. 3, 1847, soon after arriving in Rochester. Blight’s lecture will occur in the same venue where Douglass’s funeral was held in 1895, when it was Central Presbyterian Church. Blight will sign copies of his book after the presentation. RIT’s Cary Graphic Arts Collection has created a bookplate inspired by Douglass’s The North Star newspaper and printed on an iron hand press. The bookplate image will be inserted in copies of Blight’s books. The program will also feature special musical performances, including a rendition of “Farewell Song of Frederick Douglass,” a rare piece of sheet music recently acquired by the University of Rochester. Originally published in 1847 in Great Britain, where Douglass fled to avoid re-enslavement after publishing his first autobiography, the song depicts Douglass as a heroic freedom fighter. A spiritual invocation and benediction will be offered by three members of the Rochester clergy—Rev. Julius Jackson, Muhammad Shafiq and Rabbi Peter Stein—and several spirituals will be performed by Thomas Warfield, director of dance at RIT’s National Technical Institute for the Deaf. “We are thrilled to co-sponsor this event with the University of Rochester and bring David Blight to Frederick Douglass’s longtime home,” said Richard Newman, a history professor at RIT. “This exciting program will allow the entire city to more deeply reflect on the life and legacy of Douglass during the bicentennial of his birth,” said Jessica Lacher-Feldman, assistant dean and the Joseph N. Lambert and Harold B. Schleifer Director of Rare Books, Special Collections and Preservation at UR. On Dec. 4, Blight will join Kenneth Morris Jr., a direct descendant of Douglass, at a program on RIT’s campus, “American Diversity & Frederick Douglass: Lessons from the Prophet of Freedom,” from 10 a.m. to noon in Wegmans Theater in the MAGIC Spell Studios Building at RIT. It is free, but registration is required. The first hour will feature commentary by Robert Benz, co-founder and executive vice-president of the Frederick Douglass Family Initiatives, an advocacy organization dedicated to community outreach; Carvin Eison, project director for Rochester’s Frederick Douglass Bicentennial Committee; and Olivia Kim, adjunct professor in RIT’s School of Art and Design, who was commissioned to produce 13 statues of Douglass during the city’s Frederick Douglass Bicentennial this year. The second hour will feature a dialogue between Blight and Morris on the life of Douglass. Blight will sign books immediately after the discussion, which is sponsored by RIT’s College of Liberal Arts, Department of History, Faculty Career Development in the Innovative Learning Institute, The Caroline Werner Gannett Chair in Digital Humanities, the School of Individualized Study, and the Center for Statesmanship, Law and Liberty.